May 29, 2018 – Israel Aerospace Industries (IAI), and Honeywell, have signed a Teaming Agreement (TA) to introduce the market of airborne avionics with a jointly developed turnkey GPS Anti-Jam navigation system. The joint product integrates IAI’s GPS Anti-Jam system with Honeywell’s navigation products, as a subsystem or as an embedded solution. 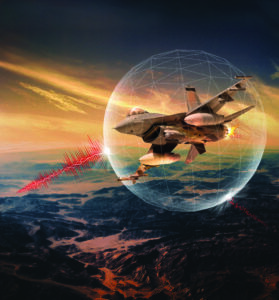 Upon successful development, IAI’s GPS anti jamming system the ADA, an advanced system that protects avionic systems from GPS jamming, will be embedded into Honeywell’s Global Positioning System/Inertial Navigation System (EGI). Modern navigation, communications, and intelligence collection and electronic warfare systems integrated in modern platforms, rely on the uninterrupted availability of satellite-based navigation and timing for their operation. Despite this dependency, most platforms do not use any counter measure systems to protect those essential assets. Remaining exposed, even low-power jammers can disrupt or even deny the operation of GNSS systems, thus degrading the platform’s capability to fulfill its mission. – As a result of contracts signed over the past year, the GPS Anti-Jam Navigation System has been sold to a number of customers and is already operational. Joseph Weiss, IAI’s president and CEO: “We’re excited to work with Honeywell, a leading company in navigation systems and avionics. This collaboration brings together the operational experience as well as the manufacturing and technology excellence of two leading companies. Based on the everyday experience, gathered by working tightly with warfighters worldwide, the joint product will provide the end users with the required features to optimize the operational capabilities of their assets. The agreement strengthens the relations between the two companies, which see the flourishing market and the potential of the growing business.